Famously tasty chipolatas. Succulent British pork made to our original Newmarket recipe.We know you value tradition, and when it comes to a truly tasty British favourite we know you want the best. Our artisan sausages are prepared in small batches and made with prime pork from British pigs. 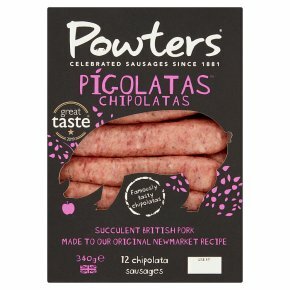 These chipolata-sized Pigolatas\ are famous for the way the spicy heat of pepper balances with aromatic nutmeg and our unique parsley and thyme blend. Perfect for breakfast, with your Sunday roast, or as a snack for the little ones! Moderate preheated grill for 15-20 minutes, turn occasionally. Bake: preheated oven at 190 C 375 F, gas mark 5 for 30-40 minutes, turning once. Lightly oil coated pan, low heat for 20-30 minutes, turning frequently. For tastiest results:Do not prick sausages. Ensure you serve them thoroughly cooked.